What have vaccines done to your kids. Have CPS social services taken your children after vaccine damages ? PRO AND ANTI VACCINE’S PLEASE TUNE IN. In 2012 and 2013 outbreaks of measles occurred in large numbers of children and adults in areas of highly vaccinated populations in the North of England. The North of England outbreaks involved the same MMR vaccine in use in the USA, Merck’s MMR II. Instead of warning parents in the North that their children were at risk and taking precautionary measures, nothing was said. The British public were not told the MMR vaccine was failing to protect children from measles. A classic diversionary misinformation tactic was employed by British health officials to cover up this major failure of the MMR vaccine to protect children from an age old childhood disease. CHS brings its readers full details of the official figures with extracts of the official documents in which they appeared. As CHS previously reported, a journal paper published in 2012 reported that Merck’s MMR II vaccine was not working and a new vaccine was called for by the author: Mayo Clinic Expert Confirms Measles Vaccine Is Failing – So it’s NOT the unvaccinated. 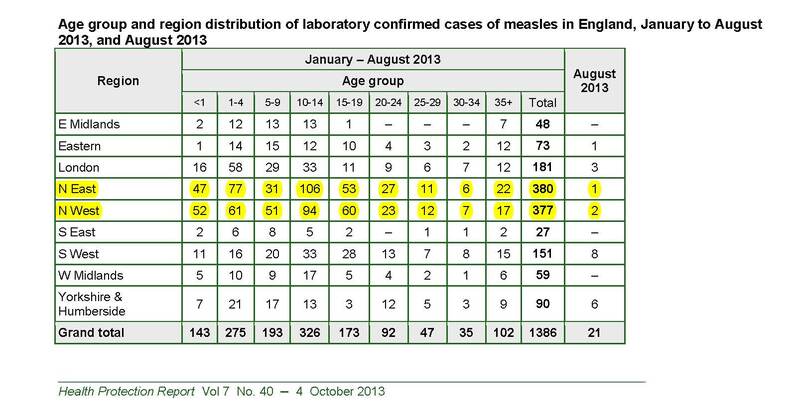 In January and February 2013 there were 265 laboratory confirmed cases of measles in the North of England reported on Page 4 Health Protection Briefing Note 2013-19 Measles outbreak in England Jan+Feb 2013 authorised to be published by Dr Mary Ramsey of Public Health England Centre for Infectious Disease Surveillance and Control (CIDSC). 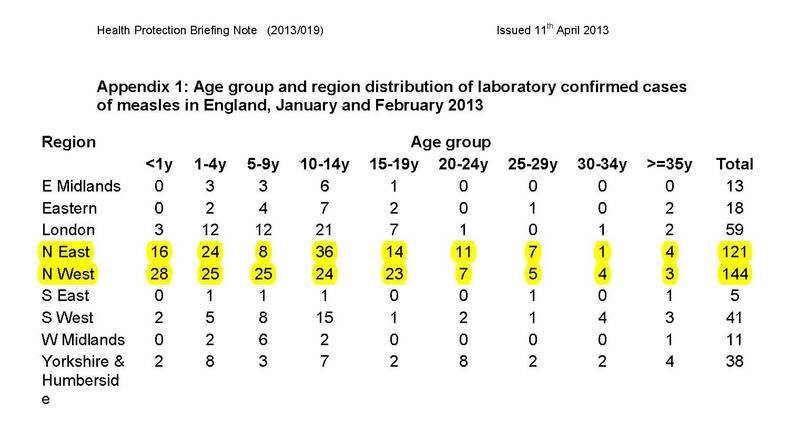 These were over half the confirmed cases in the whole of England in 2013 up to that time [450 laboratory confirmed cases]. It was predictable that the North of England measles outbreaks in these highly vaccinated populations could cause outbreaks elsewhere in the UK. And it seems they did. In comparison to the already far higher numbers in the North of England which had started at the beginning of November 2013, the position in Wales was comparatively insignificant. By 7th February 2013 there had been approximately 40 laboratory confirmed cases in Wales. The October 2013 final report into the Welsh outbreaks confirmed there had been 168 measles notifications compared by that time to the 1800 notifications in England and exceeding 900 in the North of England. UK government health officials in early 2013, lead by Dr Mary Ramsey of Health Protection England, deliberately focussed attention on smaller outbreaks in South Wales and the public were not warned about the scale of measles outbreaks in the North of England. The media were generally not kept informed about what was happening in the North. It was made to look like the whole of the UK was put at risk by the vaccination dissenters in Wales. The truth and the official statistics indicate the reverse. The failure of the MMR vaccine was putting the country at risk of measles outbreaks. Wales was used to divert attention. Outbreaks in the UK were in effect being blamed on the many dissenting parents in Wales who were justifiably undecided about vaccination for their children in view of the serious risks vaccination poses to far too many children and the relatively low risk in comparison that measles in reality poses. Every week over months all the news in the UK about measles was about Wales and the parents who had not vaccinated their children. There were weekly media briefings and press releases over months. Little to nothing was said about the position in the North. Dr Mary Ramsey and others used the opportunity to create a scare by focussing on Wales and not publicising the scale of the pre-existing outbreaks in the heavily MMR vaccinated North of England which predated those in Wales and which it seems may have caused them. This appears to have been a cynical attempt to increase the vaccination statistics in areas of lower vaccination uptake. As the expectant and then shortly after appointed Head of Immunisation, Public Health England, Dr Ramsey would be judged on her performance in getting children vaccinated. So this gives the impression, perhaps unfairly and perhaps not, that the entire affair of measles vaccinations in England and how the outbreaks were publicised [and not publicised] were influenced by the internal political interests in Public Health England. The priority was clearly to vaccinate. Warning parents their vaccinated children were at risk from a failing MMR vaccine was not. And its was done despite officials knowing Merck’s MMR II vaccine was not working as it was claimed publicly that it did. These figures did not include any cases from September to December 2012. In comparison, in Wales there had been in total of 432 cases confirmed with onset dates between 1 November 2012 and 16 June 2013, as reported in the October 2013 final report into the Welsh outbreaks. The North of England had over twice the number of confirmed cases in a shorter period. And putting all of this into context, the numbers in Wales and in the North of England were extremely low compared to the tens of thousands of cases in the 1960s and earlier which health officials even today use to claim 1 in 1000 children will die from measles when that is knowingly a serious untruth. In the 1960s British doctors did not panic over a few cases of measles as CHS reported here with quotes from the British Medical Journal in 1959: British Medical Journal Tells Us – Measles Is Not The Scary Disease The Press Want You To Think It Is. The role of the BBC, the UK’s public service broadcaster, paid for by a direct tax, a licence fee levy on all households having a television, shows that it acts as a mouthpiece for the establishment and fails to carry out the task of responsible journalism and news reporting. When the Welsh outbreaks were dying out, a presentation was prepared on 24 April 2013 by Dr Mary Ramsey, Head of Immunisation, Public Health England and presented to the media. It is a scandal of the 21st Century that there is still no effective treatment for children who contract measles. The most powerful nation in the world cannot protect its children against a simple centuries old disease which is steadily dying out and that there is no effective treatment for measles. What is the US NIH spending its US$40 billion tax dollar budget on each year and why is it not spent on a simple effective treatment for measles. Despite vaccination millions of children still die in third world economies from basic childhood diseases. If instead there were an effective treatment for diseases like measles those lives could be saved. The President of the United States is the President of a country which has to watch from the sidelines as nuclear powers like India lead the world into space. He remains unable to protect US children from basic childhood diseases when the US has the ability to develop effective treatments to save lives. It is also a scandal that the President of the United States has recently effectively demanded and bullied parents into vaccinating their children risking serious conditions like 1 in 60 developing autism as a result of vaccination and threatening them with all-out compulsory vaccination even for those children for whom vaccination poses a clear and present danger of serious consequences and even death. 4 Not yet recruiting Study of Immunogenicity, Reactogenicity and Safety of the Combined Measles, Mumps and Rubella Vaccine Produced by Bio-Manguinhos/Fiocruz in Children 12-15 Months of Age, Followed by Tetraviral Vaccine in Children 15-18 Months.